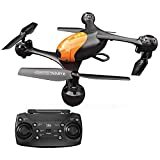 Holy Stone HS110 Drone Review 2019 – is the Holy Stone HS110 quadcopter worth the money? Review of features, pricing, flight duration, battery, camera and more. Holy Stone is one of the most renowned brands in the quadcopter/drone realm. The brand image and reputation it has built over the years are not just for the quality the company has consistently delivered over a period, but also for its ability to keep up with times and come up with evolved products. The Holy Stone HS110 drone pays testament to this fact. Therefore, let’s learn more about the HS110’s features, capabilities, pros and cons, target market, and lots more. For the price, the HS110 has quite a few features bundled in. A 720p built-in camera with the FPV functionality, one button landing/take off, headless mode, gravity mode sensor, and four-speed variable adjustment, among others. The drone can fly for up to nine minutes and as high as 120 meters, and the video transmission range is approximately 50 meters. 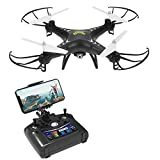 The HS110 package comes with the HS110 drone, 2.4GHz controller, four additional propellers, phone holder, USB charger, 4GB micro SD card, card reader, screwdriver, eight screws (four for blades, and four for the drone), and a user manual. 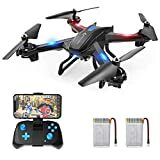 If you buy the drone at certain online stores, you may get additional batteries for free. The HS110 is 12-6 inches in width and length and 2.6 inches tall. It weighs only 108 grams, without the battery, which makes it quite portable. The lightweight body also means it doesn’t need any FAA registration. The rechargeable 650mAh 3.7V LiPo battery takes approximately 60-90 minutes to charge from 0 to 100 percent. On a single charge, the drone can fly for up to nine minutes. If you’d like to fly the drone longer, you may have to swap batteries every now and then. Despite being lightweight, the HS110 is a big quadcopter. The camera hangs right below the drone, with the battery plugging in from the rear. The LEDs located below the arms are visible clearly, and they’ll keep you in the know about the pairing status between the transmitter and drone. The LED lights also notify you about battery and GPS lock status. The blade guards are not mandatory, and you may remove them if you’re extremely confident about your drone-flying skills. The build quality is one of the major highlights of this drone. In fact, it outdoes quite a few drones that are above its price range in terms of build. However, the thread isn’t the most durable. Forcing the screws in a lot when changing guards/blades/landing gear could damage the thread. Camera is there but it isn’t the strongest point of the product. The camera that comes in the box can record images or video in 720p. The highlight feature of the camera is its real-time FPV (first person view) transition. In other words, the camera enables you to see things the way the drone would witness its surroundings. The FPV function can be used in conjunction with your Android or iOS device. 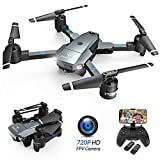 No doubt, the feature significantly enhances the picture and video quality that comes out of this drone. Overall, the camera is a mixed bag. It is facilitated by quite a few handy features, but the camera hardware itself is quite mediocre. The 720p wide angle and the barely noticeable stabilization is not something to brag about. There is a 90-degree electronically adjustable tilt, which is controlled by a scroll wheel. The photos and videos that the camera captures are automatically saved to the micro SD card. The drone doesn’t take too long to get off ground. The one-key take-off mechanism helps a great deal here. The same button is used for landing the drone afterwards. The speed is adjustable, and transmitter is responsive, which makes things quite easy for beginners. The HS110’s Altitude Hold functionality lets you hover the quadcopter in mid-air. This feature helps plan how the drone should capture shots even when the drone is up in the air. The accelerator joystick lets you further position your quadcopter or ascend and descend it to your liking. Another flight feature worth mentioning is headless mode, which lets you fly the drone without worrying about the drone’s orientation or position in the air. The four-speed adjustment functionality would interest the advanced user more. The one button landing/take off feature makes taking off and landing the drone a breeze. If you are not sure how to land the drone without breaking it, this feature shall come in handy. The HS110 isn’t the best drone to fly indoors, but the LED navigation lights and overall lighting system make the quadcopter ideal for flights during night time. Packing in so many flight features can make it tough for a specific aspect to truly stand out. But in the case of the HS110, there is one feature that’s unique and extremely handy, and it is the Return Home function. The feature is quite advanced for a drone at this price point. It, in fact, should be built into pretty much every amateur or mid-range drone as it ensures first-time drone users do not lose control over the drone. The Holy Stone HS110 is a complete, fully equipped drone for the price. It packs in pretty much everything you could ask for in a drone, including a 720p camera. Kindly note most drones, within the HS110’s price segment, do not come with a camera. In fact, some even don’t have a dedicated space to mount a third-party camera. As a result, the Holy Stone HS110 drone manages to attract beginners and experts alike. That said, this drone does not fit into the category of drones that experts would consider buying right off the bat.